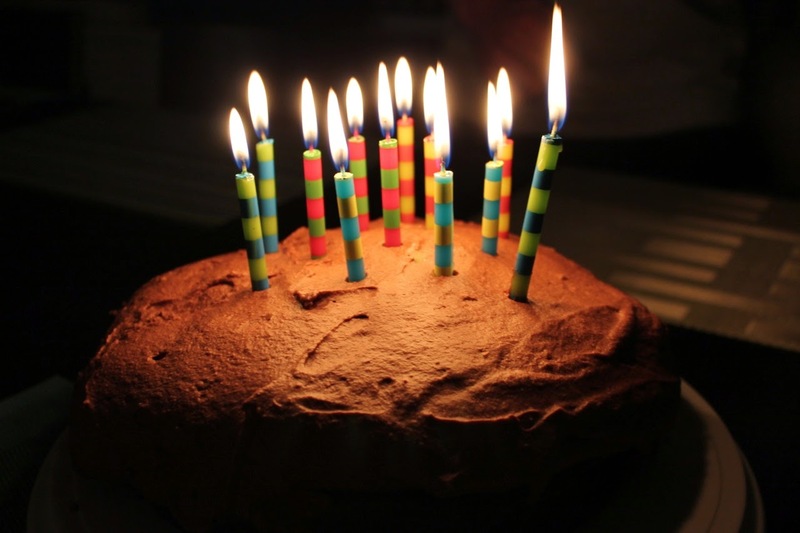 Regular Cook In / Dine Out readers may remember that I have a tradition of making my own birthday cake. Last year, it was a Chocolate Truffle Cake, the year before, Lemon Cake with Honey-Mascarpone Frosting. Chris always offers to buy me a cake, but I'd rather make it myself, since it will turn out better, I can make something more interesting at a reasonable cost and I enjoy it. Pluses all around. This tradition actually started during my childhood--around my tween years as I recall. That's when I first started getting into baking. Back then, it wasn't from scratch, but learning to bake from cake mixes isn't such a bad thing if it gets kids into the kitchen. For this year's birthday cake, I wanted to make a from-scratch version of one of the "box cakes" I remember loving as a kid: a triple chocolate cake that consists of three layers: a bottom layer of chocolate cake, a middle layer of thick chocolate sauce and a fluffy top layer of chocolate mousse. Yes, there was such a boxed cake back in the day. Unfortunately, I cannot remember nor find on the web what it must have been, so you'll just have to trust me. That version surely involved three separate envelopes, their contents mixed with water and the cake baked. For this more complicated but (hopefully) tastier version, I combined components of three recipes: 1) Regan Daley's chocolate cake, which I made with Peanut Butter Frosting a couple years ago and is my all-around favorite chocolate cake recipe for its simplicity and amazing taste; 2) a simple ganache for the middle layer; and 3) my friend Jason Shriner's (a.k.a. The Aubergine Chef) cooked chocolate mousse recipe, which I adapted from his recipe for a similar layered chocolate mousse cake. 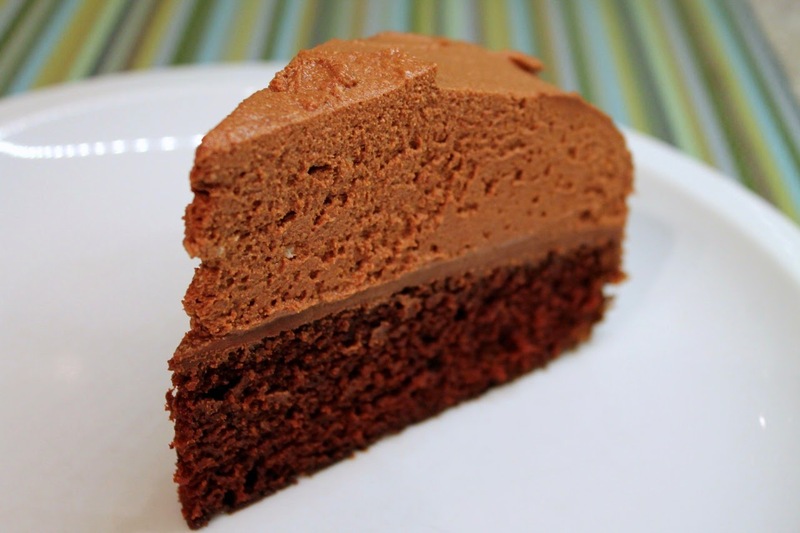 The cake and ganache are simple to make, but the mousse requires some degree of finesse. Of course, it would be easier to make chocolate mousse with raw eggs, which would require lots of whipping and no cooking, but raw eggs carry the risk of salmonella, which can knock you down even if you're not in a high-risk group (i.e. elderly, compromised immune system, etc.). I'd actually been interested in a cooked chocolate mousse for some time, so was quite pleased to learn about this recipe--one of the first things Jason and I talked about when we met last summer. A double boiler can be purchased, but also easily improvised by placing a heatproof glass mixing bowl over a medium saucepan. This recipe uses a double boiler extensively for making the chocolate mousse, and here I also used it for making the ganache. The mousse requires the use of a double boiler: a pan of boiling water with another pan or a heatproof bowl set above the boiling water. Rather than the direct heat of the stove, the double boiler uses the steam of the boiling water to heat the mixture. Thus, it's a more gentle heat useful for cooking things like eggs and chocolate that can quickly overcook and become ruined. You can buy a double boiler, but I think it's just as easy to make one by using a glass mixing bowl set above a medium-size saucepan. Cooking the egg yolk properly was the most difficult step. The trickiest part of the mousse recipe is cooking the egg yolks. Four egg yolks isn't a lot of volume, so I found it difficult to get accurate measurements from my instant-read thermometer while cooking them. During the first try, I overcooked them (they became hard and no longer stir-able), and by then the steam had made the thermometer crap out, so on my second try I winged it by cooking the egg yolks until they had thickened and turned a bright yellow but were not getting hard. It would probably be easier to use a smaller double boiler for this, since the thermometer could get a better reading if the egg had more depth in the bowl. Cake with mousse on top: I told you it wasn't the prettiest cake, but look at the first photo of how lovely it is once sliced. The second trickiest part is shaping the cake. I'm no perfectionist when it comes to how desserts look. I'm much more interested in how they taste (hence, you'll probably notice that I'm not into detailed cake decorating). So I wasn't too concerned that the chocolate mousse was a bit lop-sided on top. The tricky part is that once the mousse is mixed, it's not particularly stiff. It will stiffen up in the fridge. After I had chilled the mousse for 30 minutes, I put the first application on the cake, but it started to run down the sides quite a bit. So I chilled it for another 10 minutes before adding more. Thus, the somewhat mushroom shape to this cake, which didn't bother me in the least (it tasted amazing), but if you're more particular about this, you might want to wait until the mousse is fairly stiff before putting it on the cake or somehow construct a form to hold the mousse in place (although doing so might smear the ganache that has dribbled down the side). Another birthday cake and (not pictured) satisfied birthday boy. Cake recipe adapted from All-in-the Pan Chewy Chocolate Cake with Chocolate Butter Icing, In the Sweet Kitchen by Regan Daley; chocolate mousse recipe adapted from Cooked Chocolate Mousse Cake from The Aubergine Chef by Jason Shriner. 1. Preheat oven to 350 F. Grease cake pan, line bottom with parchment and flour, tapping out excess. 3. 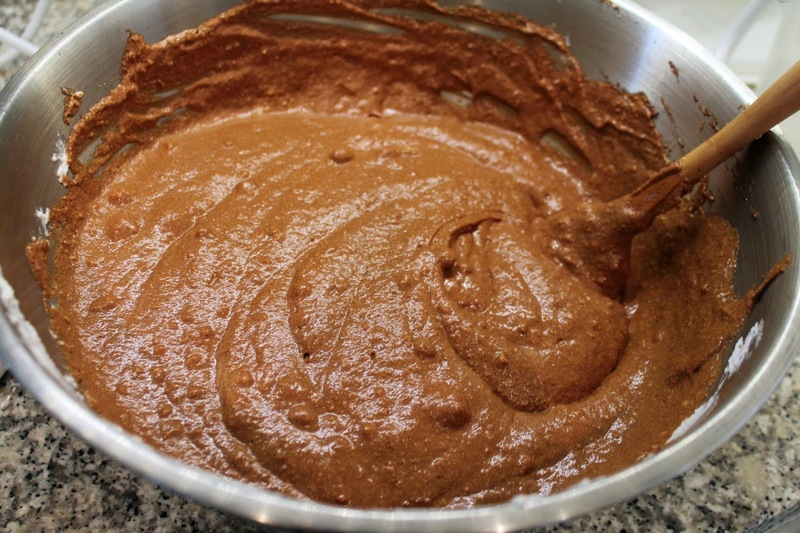 Pour batter evenly into prepared cake pan. Bake about 30 minutes until a wooden skewer inserted in the middle of the cake comes out clean. Transfer pan to a wire rack to cool completely. When cool, run a knife around the edge, invert cake pan and discard parchment. Place cake on a cake plate. Heat cream in a small saucepan over medium heat until it begins to simmer (alternatively, you can make the ganache in a double boiler, which I did only for the sake of not having to wash another saucepan, since the double boiler is needed for the mousse). 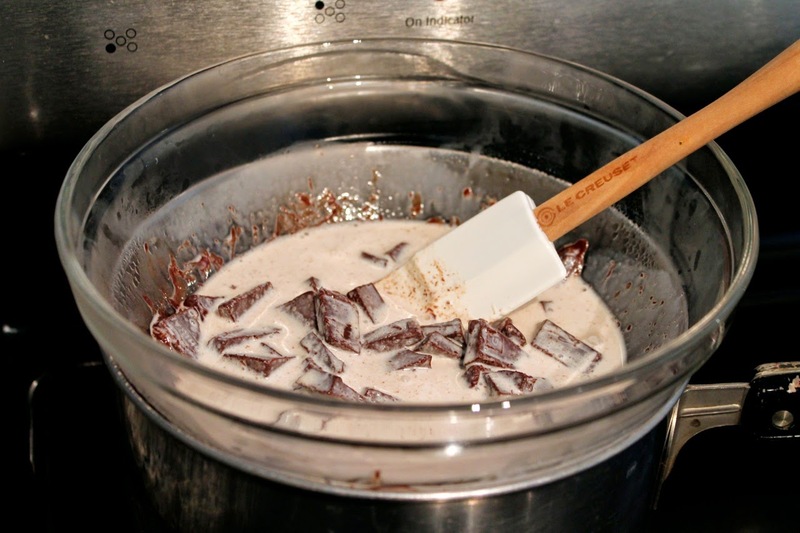 Remove from heat, add chocolate and whisk until smooth (the hot cream will quickly melt the chocolate). 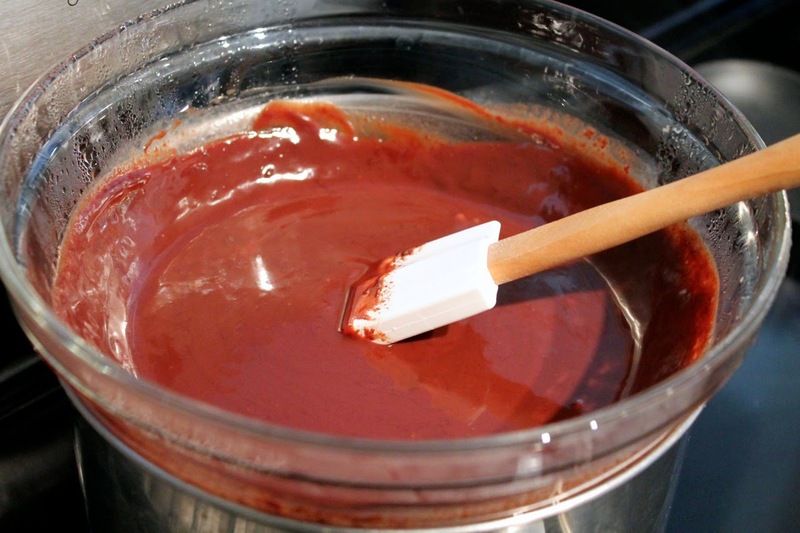 Set saucepan on a wire rack to allow ganache to cool to room temperature (be sure to allow ganache to cool enough so that it thickens, but be careful about cooling it in the refrigerator, as it can get too hard). Pour ganache on top of cake, allowing some to drip down the sides. Refrigerate cake until the mousse is ready. 1. In a small heatproof bowl suitable for a double boiler, whisk together egg yolks with 2 tbsp. sugar. Set bowl over a small saucepan filled about halfway with water (water should not touch the bowl once the bowl is set in the pan) and bring water to a boil. 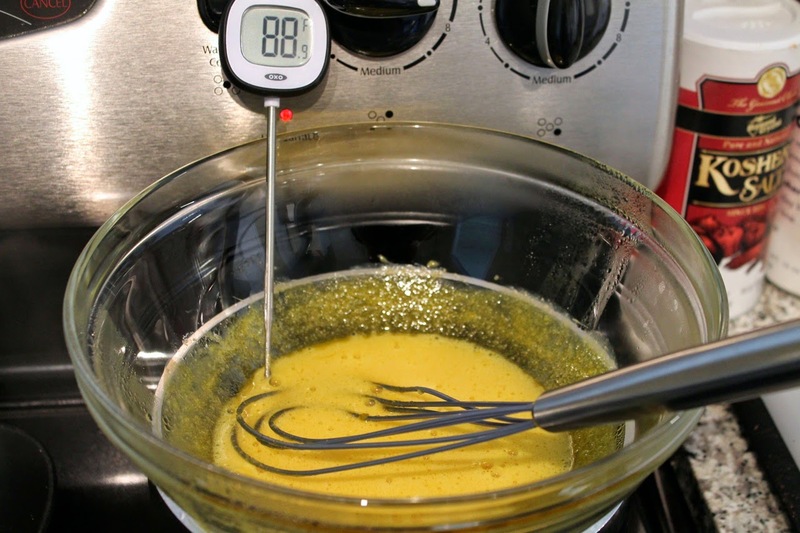 Cook egg-sugar mixture, whisking frequently, until thickened and temperature on an instant read thermometer is at least 150 F, no more than 165 F (be careful not to overcook or the yolks will solidify). Set bowl aside to cool (do not refrigerate). 2. Whip heavy cream in the bowl of stand mixer (or in a large bowl using a hand mixer) until it reaches soft to medium peaks (run a spoon through the mixture to make a peak and the peak should fall over). Transfer whipped cream to another bowl (you need to stand mixer ready for step 3). 3. Combine egg whites and remaining sugar in another heatproof bowl (you can transfer the egg yolk mixture to a different bowl if you don't have a lot of heatproof bowls set over the pan of boiling water. Cook, whisking frequently, until the mixture reaches a temperature of 150 F (up to 165 F) on an instant-read thermometer. Set bowl aside to cool (do not refrigerate). When cooled, whip egg whites in the bowl of stand mixer until medium peaks form. 4. In a heatproof bowl set over the pan of boiling water, add the chopped chocolate. Stir until the chocolate has melted, then add the butter. Remove from heat and stir in the butter as it melts. Add the cooked egg yolk and stir to combine (the mixture will thicken). Transfer to a large bowl and set aside to cool (do not proceed to step 5 if it is still hot). 5. Scoop a large handful of whipped cream and add to the chocolate mixture. 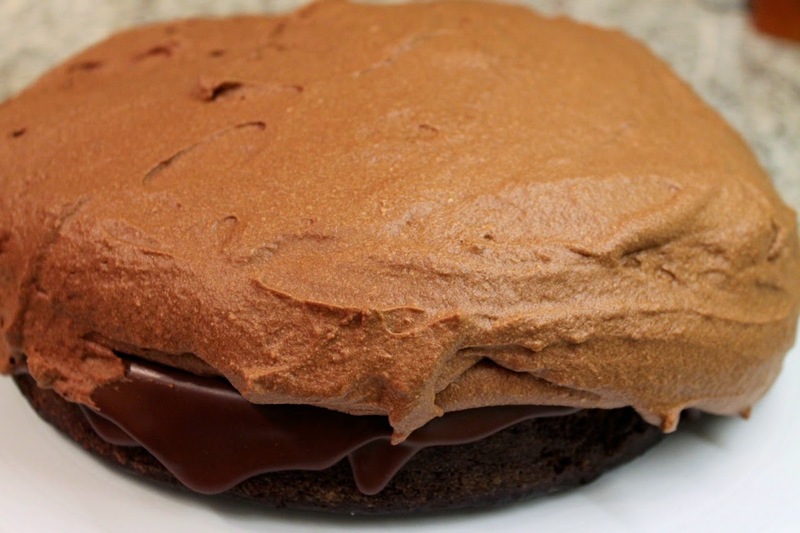 Using a clean spatula, fold the whipped cream into the chocolate. Continue folding large globs of whipped cream into the chocolate until it is all mixed in (should take 4 or 5 additions total). Using the same method, fold in the cooked egg whites. Place mousse in the refrigerator to cool for 30 to 40 minutes (mixture should be firm enough to hold its shape but not fully set). 6. 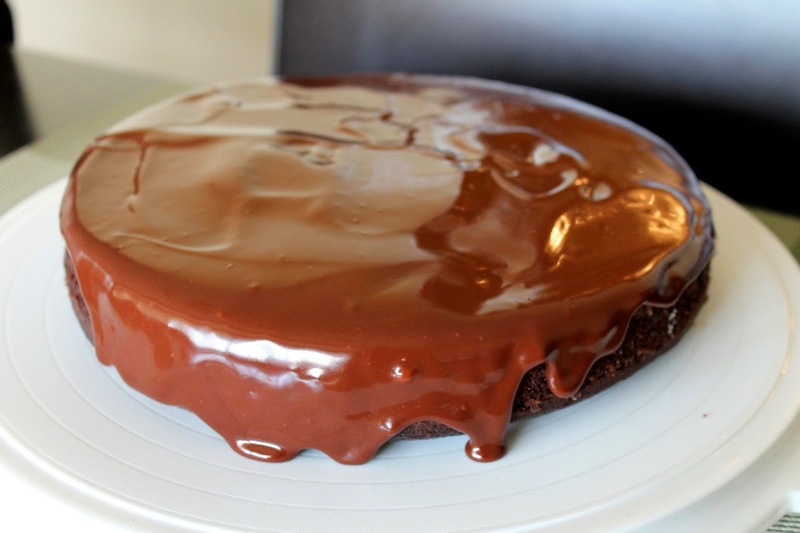 Scoop the mousse onto the ganache-coated cake and use a offset spatula to mound it evenly. If the mousse is still too thin to do this, return the mousse to the fridge for another 10 minutes. I tried putting the mousse on the cake a little too soon and some ran over the side. It still tasted delicious, but didn't look quite as pretty as I was hoping for. Chill the cake until the mousse is set, another 2-3 hours. What a great cake! I enjoyed the heck out of this. Cheers to the Aubergine Chef, Jason Shriner, for his amazing mousse recipe. Thanks honey. I'm glad you enjoyed it. I wish we had another one! Looks great Andrew! I'm glad you liked the mousse recipe :) Sorry the mousse was being difficult for you - ideally you're supposed to use a cake ring, springform pan, or cake pan with a removable bottom to help set it up nicely. What if you let the mousse set up for an hour and put it in a piping bag and piped it? That's a really good idea about piping it. It would have looked nicer that way. Regardless, I was really happy with how it turned out even if, in my impatience, it was a little lopsided. That mousse tasted fantastic! That's right! I forgot about that. Yeah, I'd give that a go (not sure if I'd eat it all though--we'll see).